My daughter actually ASKED me to make her something! 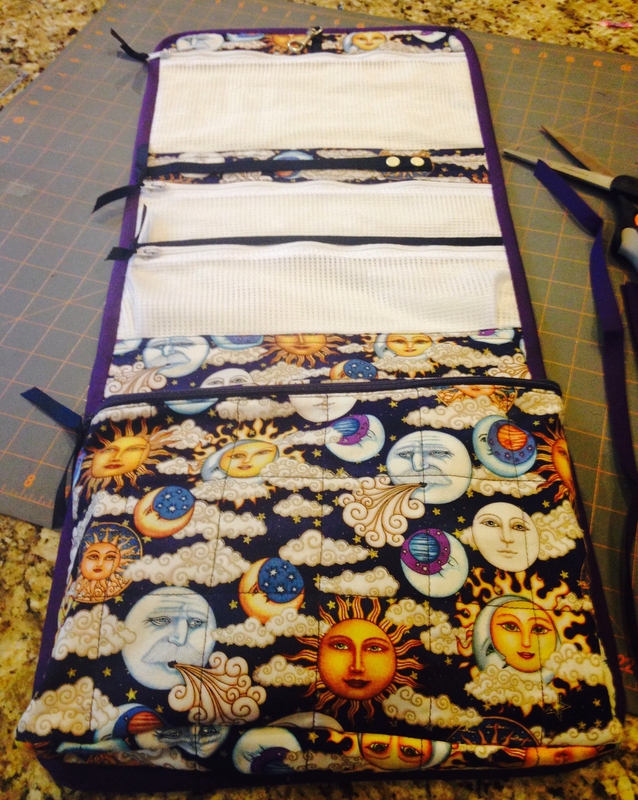 She needed a cosmetic and jewelry case that would work for traveling and for the dorm room. 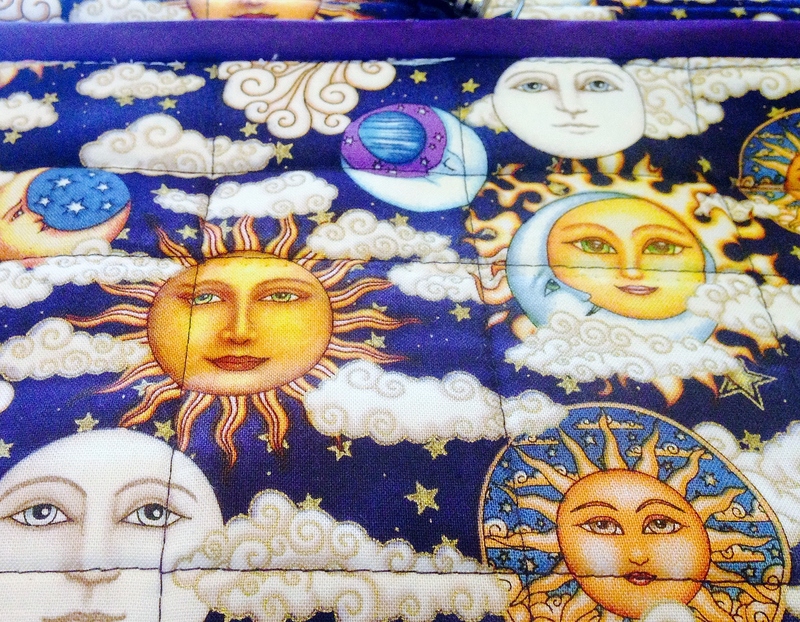 We visited The Stash and she selected a Stars and Moon Face fabric. A yellow quilting cotton was used for the lining. The bag is based loosely on Travel Essentials by Annie. The bag includes 4 zipped sections. Three were made with mesh cut from a laundry bag. The mesh allows one to see what is inside the pockets and wears (and washes) better than vinyl. The whole thing rolls up for travel. It even has a carrying handle. Construction of the bag required a few starts and stops. The pockets were sewn to a separate lining piece. All raw edges were turned under, even the mesh pieces. The lower pocket is fully lined. 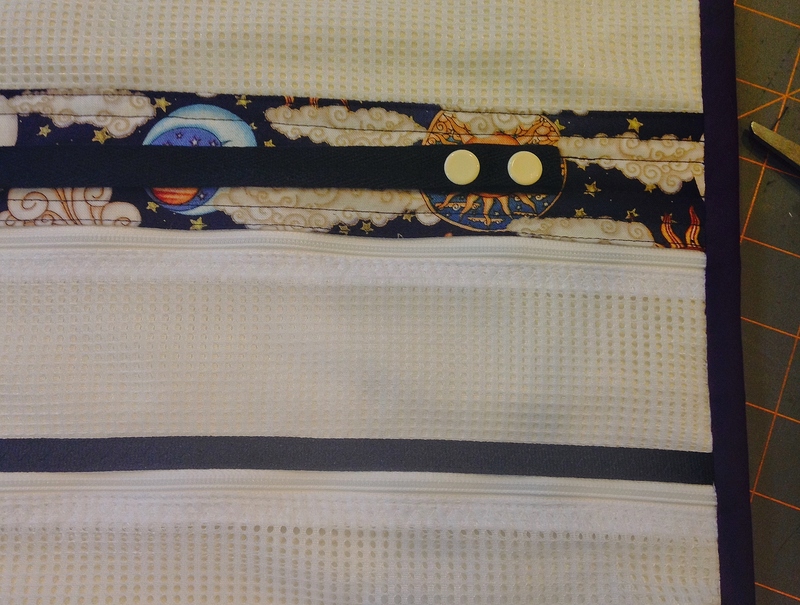 After completing all the pockets and securing them to the lining – it was stitched to the outer quilted piece. Lower pocket. Depth is 1.5″. Add at least one more closure/hanger. When hanging, the single center hanger location will cause the bag to tilt. 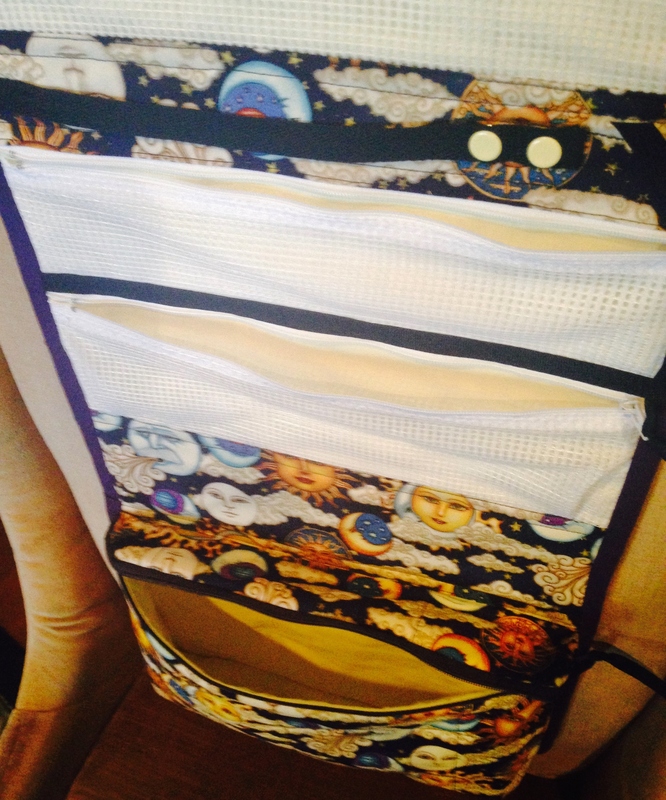 Finish the ends of the lowest pocket zipper with fabric to reduce bulk in binding. Use a stiffer batting in base and an interfacing in lowest pocket. Use pleats in lower pocket rather than sewing on the base piece. The bulk at the lower corners broke sewing needles. The Zipper Stash was not able to help with this bag. Although I did use the zipper from the laundry bag for one of the white zippers. As this bag requires a total of 4 zippers, I will have find a bargain zipper supplier prior to sewing additional bags! 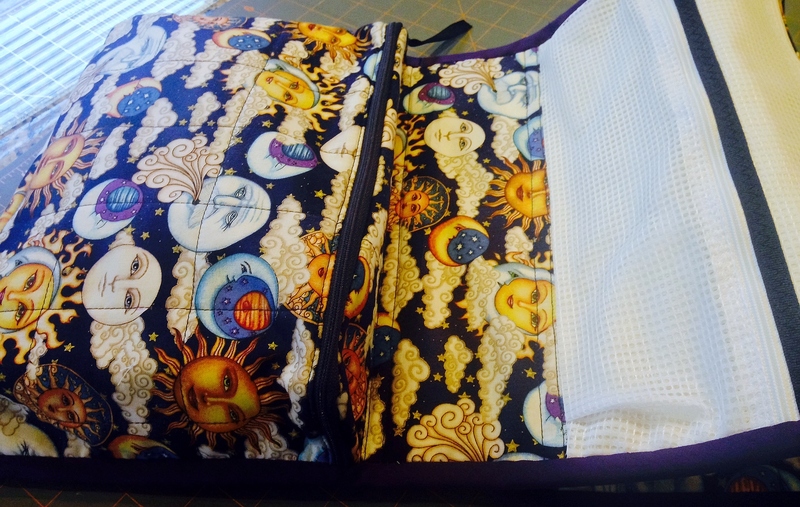 This entry was posted in Accessories, Bags, Quilting, Scrap Couture, Sewing, Sewing for a Teenager, Stash Couture and tagged cosmetics organizer, Sewing a Cosmetic bag, sewing cosmetics organizer, sewing traveling cosmetic bag, Sewing traveling jewelry bag, travel essentials. Bookmark the permalink. So much fun,I love a colourful toiletries case! I buy my zippers from http://www.cleanersupply.com/ – you can get great prices. I liked your fabric the minute I saw it! You say “based on”, does that mean that you made it all yourself? No pattern? Love that fabric, too! Wish I had more! About the “based on,” ….. I did not want to disparage the pattern or its author in the post. I love the design! It was just what my daughter needed. However, the 9 pages of 4 pt font instructions were incomprehensible! (even for long time sewist and engineer)! 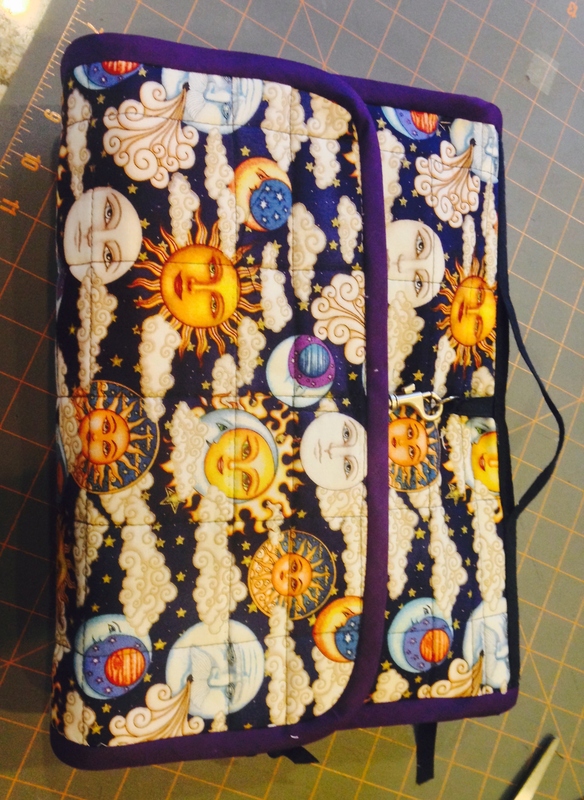 So, as many sewists do with many patterns…I looked at the pictures and winged it! Now that my daughters have outgrown Christmas stockings, every year I make them some kind of jewelry or cosmetic bag to contain the mascara and winter’s supply of chapstick that were always included in the stocking, and which they insist they can’t do without. Love the idea of using a laundry bag. The laundry bag mesh washed up very well. Even the spills of mascara and liquid foundation! I don’t like to use plastic as it does not wash – shortening the usable life of the cosmetic bag.